Honest Reviews By Affiliates – How Much Can We Trust? 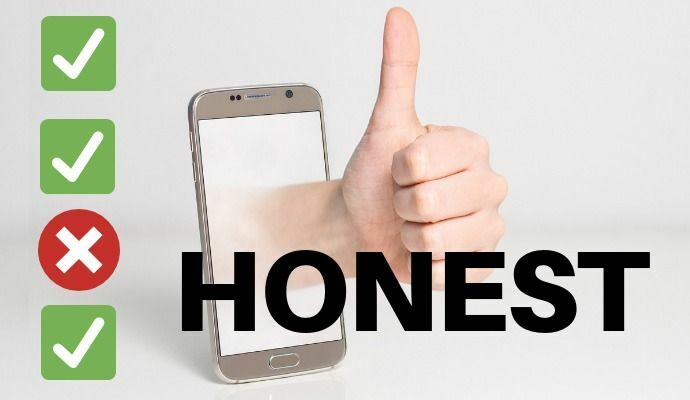 >> Honest Reviews By Affiliates – How Much Can We Trust? As a buyer, you should always check a few user reviews before you purchase a product on internet. But spotting honest reviews can be tricky; you should be wise enough not to trust every review offhandedly, but it's pretty ridiculous having to question each reviewer's integrity. This article from NBC helps you to find out which product reviews are genuine, for example. How Trustworthy Are 5 Star Reviews? Many product reviews are published by affiliates. 4.5 - 5 star reviews can be questionable in users' point of view. Because affiliates write favorable reviews in order to earn commissions. There's a very thin line between affiliate marketing and stealth (guerrilla) marketing. Some wise affiliates try their hardest to find some weaknesses in a product and add a section to criticize it ("con's")... So that their review will appear to be authentic, even if they really love the product. They could deliberately lower the ratings from 5 starts to 4 stars in order to appeal that they're not selling the story for commission. How Trustworthy Are 1 Star Reviews? On the other hand, look at some 1 star product reviews written by bloggers (affiliates). They severely criticize the product from top to bottom and stamp "scam!" - nothing's wrong with that. But at the end of the page they promote something else that's they're affiliated with. It's an awesome affiliate marketing method. People tend to trust the most critical reviews more than favorable reviews. So they find as many bad products as they can, slam them and make sure the readers are directed to their recommended product page via affiliate link. But how can we tell if their personal opinion is honest and unbiased? A while ago I entered an affiliate arrangement with this company to promote their product - let's just say Product A. I loved it, except the company's level of support. I thought the product quality was good, it was easy to use, but the technical support ignored 3 of my support tickets completely. I sent them a couple of more emails. No response whatsoever. I was really unimpressed by it. I put that in my review just that, with a 3-star rating. Would I recommend the product? Yes for now, but I can't approve it fully in case you purchase it and encounter a problem with it. At least it offers a 30-days money back guarantee, and if it doesn't refund money (0% response rate tells me it's most unlikely) you can always claim a dispute against your credit card company. To my surprise - a few users have purchased the product via my affiliate link. Is it because they trusted my review, or just by coincidence (they also read other reviews but happened to access from my link)? I never know. I can only hope that they're happy with the product. My affiliate manager was not happy when she read my review (understandably). We had a lengthy discussion over the improvement of the support system - remember, I don't work for them. I'm just an affiliate. She offered me to try out their new product for free in exchange for editing my original 'Product A' review. It was nice of her but that would be blackmailing. I cannot write about what I didn't experience. Nobody's perfect, but the fact that their technical support is virtually dormant, that's something I can't overlook. Fortunately I've made some commissions out of the review. Unfortunately now I've upset my affiliate manager, she could consider cancelling our agreement at any time and I might lose my current earnings as well as any potential future affiliate commissions from this company. That would be a shame because I really like this product. Then again, being able to express my honest opinion and share true experiences is the best part of writing a blog.